I’m way past due in announcing my pregnancy! I’m 24 weeks today, and finally, feeling great again. Here’s the rundown on how things have gone so far. My due date is January 8th, 9th, or 10th. Different times they’ve said different dates. This is sandwiched right between the end of my busy season and the beginning of Ben’s. I’m guessing she’ll be born on Kimmy’s birthday – January 15th. Ben is hoping for January 11th. If that happens she’ll share a birthday with two cousins – Charlie and Jace. I’ve decided to go with a birthing center this time around. I was going to go the hospital route but I wanted to check out against medical advice right after delivery. After some thorough research I couldn’t seem to find an OB I was excited or comfortable with. I didn’t want to go with the last one again; had a bad experience since McKay’s delivery. 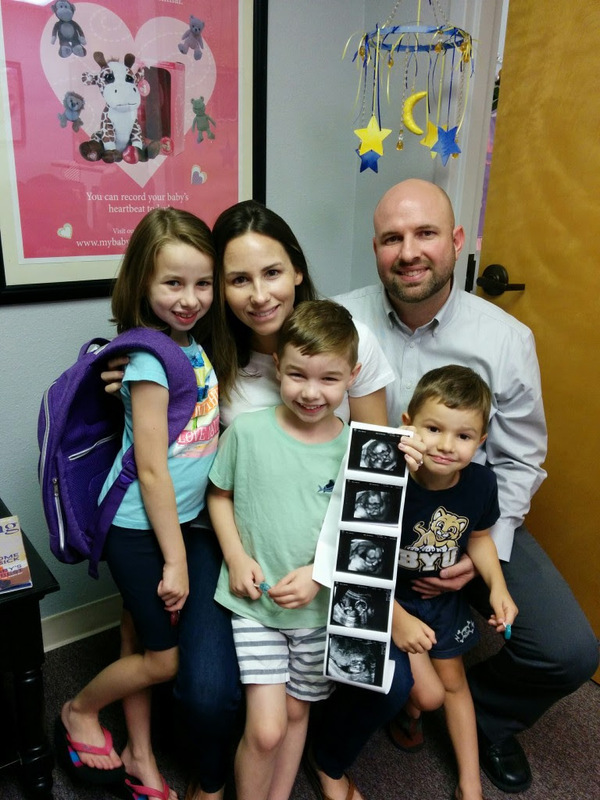 While researching, I stumbled upon the amazing, glowing online reviews of the birthing center where Julie has delivered her Florida babies. I had toured it back when I was pregnant with Jax and had been very impressed at that time. I did another tour and it was just want I was looking for, so I’m going for it despite the concerns of not delivering in a hospital. Praying all goes smoothly! I’m very excited. The first trimester was rough. I don’t know if my memory has faded from my previous pregnancies, but I believe this one was my hardest. My nausea was quite severe. On Jax’s birthday (around 11 weeks pregnant) I was out shopping with my mom and the kids and I had sit down and not talk quiet a lot to keep from getting sick. My mom mentioned she had some medicine for nausea, which I got from her that very same day, and it completely changed my life! That woman always has the solutions I’m looking for! I used it sparingly but it was just lovely to have that relief! One nice thing about this pregnancy is I’m able to nap almost any day I want. Wish I had that luxury during the last three pregnancies! If the kids are home I just tell them to play quietly, or they watch a half hour show and then play while I sleep. I’ve taken advantage of this and I nap probably 4 days a week. Especially on the days I have photoshoots so I’ll still be energetic in the evenings. It’s been so helpful! At 15 weeks we went for a special gender determination ultrasound. I really, really, really wanted a girl! Ben keeps telling me this is our last baby, though, I’m left wondering if maybe we should have one more but accepting of the fact we won’t. I’ve always felt like I had or needed one more daughter so if this was a boy I was worried I’d feel conflicted. I told myself over and over that I just need to be happy and grateful regardless of the gender, but I couldn’t help pushing aside the desire for a daughter. So, at the appointment we were looking up at the fuzzy screen and Ben and I saw what we thought were boys parts. I was so sad but trying to be happy since my mom and the kids were there. Ben said, “It’s a boy, right? Is that what we’re seeing?” The tech said, “Don’t be too sure!” So after another minute she finally announced, “It’s a girl.” Such happiness! One of the happiest moments of my life, perhaps. I cried or sobbed I was so happy and relieved! We feel so blessed that we’ll have two of each gender. I’m so grateful Sadie will have a sister! The kids are beyond thrilled about the pregnancy. They are very curious and bring it up a lot. They all love to talk about her size, what her name will be, where she’ll sleep, who will feed her, etc. They love to rub my belly and talk to her. McKay is adorable when he does it as he whispers so soft and sweetly and says the most tender things, “It’s me McKay, your big brother, and I will take care of you.” They also love to feel her kick which she does quite a lot. I think she is excessively strong and active for her age. All the kids had felt her strong kicks by 18 weeks. I’m 24 weeks now and we can sit and watch my belly move around. The kids find it so fascinating. It’s so cute and fun to go through the pregnancy with them and to see all their excitement at each step. I hesitate to share names we are considering, but I guess I’ll go ahead. I was quite stuck on Andi for a while and Ben loves Morgan. I love the sentimentality of naming her after my mom, Mary or Mary Kate. Ben likes Mary but not Mary Kate. He mostly choose the boys’ names so he thinks I should name this one, but I’d like for us to have a name that we both love. The kids have a plethora of hilarious names they’re trying to talk us into. Right now they insist her name will be Andi which is dangerous because I think it’s going to be hard on them if we don’t use that name. Time will tell. Ben and I aren’t committed to anything yet. My food cravings this time around have been lemons and bacon. I haven’t had much interest in sweets at all. Very unusual thing for me. I try my hardest to avoid bacon, but it’s hard to ignore that screaming desire. 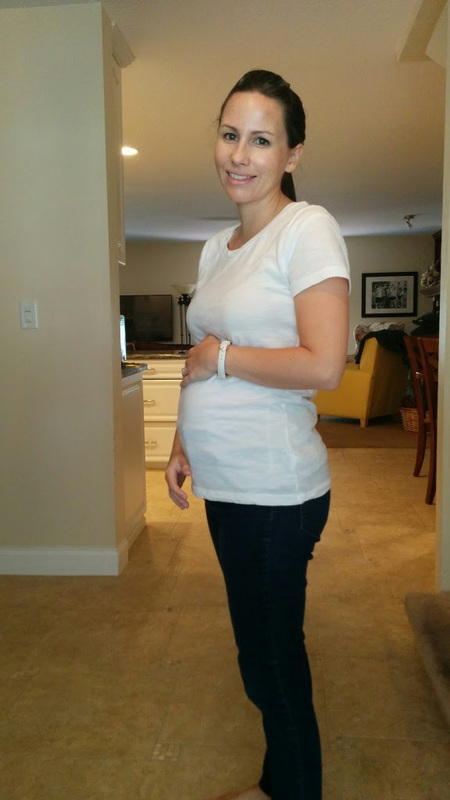 We ate out at restaurants almost every day of my first trimester. I couldn’t cook or go to the grocery store without feeling sick. I think we ate least doubled our food budget those months. Ben was supportive. If I could get the food I was craving and eat just the right amount it would settle my stomach and give me a few hours of relief. Those were cherished times and a price tag could not be put on my happiness in those moments. Not sure if we’ll look back on this in years and laugh or if it will develop into a worldwide problem, but right now one major concern for pregnant women in Florida is the Zika virus. I’m not overly paranoid but I am cautious to wear pants and use mosquito repellent when I’m outdoors. One more thing to worry about! 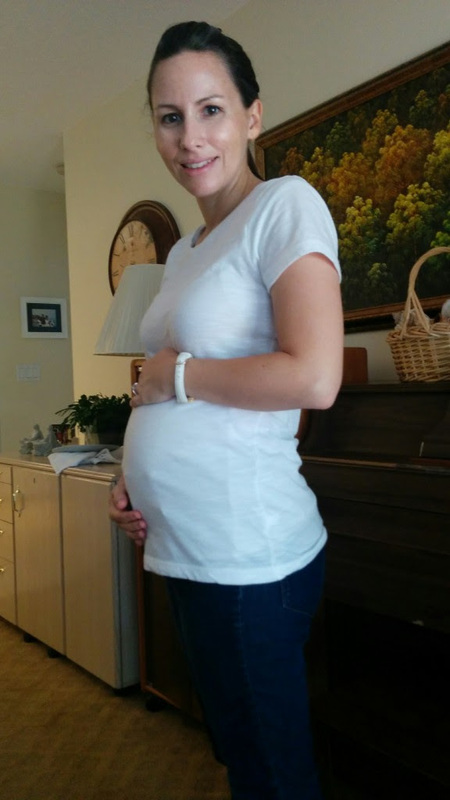 This was a belly snapshot at 20 weeks. The great explosion has begun. I’ve put on a whooping 6 lbs in the last 4 weeks since that picture above! I’m 24 weeks now and this was a picture from last night. I’m starting to feel big and bulky, but at least my energy and appetite have returned. I’m so excited to have a baby again. My arms ache to hold her. There is a big part of me that’s nervous for her arrival, though. I’m worried how I’ll juggle everything since life is pretty busy as it is. I try to have faith that things will all work out and I’ll be given the strength to do manage it all. Life works out. It always does. So, though nervous, I’m hopeful and excited.